What is that hacking noise? There’s a Chicken Bone Caught in My Dogs Throat !! I’ve heard that phrase over 1000 times since graduating as a Veterinarian. In reality I’ve Only ever had 2 dogs presented as an emergency with a bone lodged in their esophagus……..all the other dogs with the similar complaint had Kennel Cough. Infectious Tracheo Bronchitis or Kennel Cough is caused by a combination viral and bacterial respiratory agent which is Infectious to dogs ONLY not to you or your children, family or friends. Where ever there are social groups of dogs kennel cough is a risk. 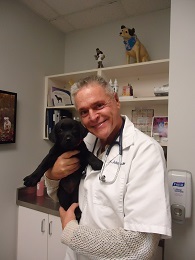 We see coughing dogs at Royal York Animal Hospital now more than ever in the past due to off leash parks, doggy daycares and just generally because dogs are included in so many aspects of are life now and tend to go many places where there are other dogs. Dogs are just sociable. The infection for this “Kennel Cough” is in the trachea or tube the dog breaths through and when the dog gets excited ie breathing faster or is pulling on their leash they will begin a hacking cough. Many owners report the dog is vomiting or choking when in reality the dog is hoiking up a mucousy phlegmy spit or saliva from the trachea. True vomiting would normally be from the stomach and be composed of food or yellow bile. Kennel Cough is a dog cold affecting eyes, nose and throat and rarely goes to the chest. Incubation period ie time from exposure to showing the signs of kennel cough is 3-4 days and the signs will last 10– 21 days. Antibiotics are sometimes given to treat the bacterial component and cough suppressants may be used to numb the cough reflex. Prevention is by vaccination. Just like the human flu, there are many strains..there is no ONE vaccine that covers all strains of Kennel Cough. If vaccinated and exposed to the Kennel Cough Infectious agent the cough is usually less severe and only lasts a few days. If you have any Questions about Kennel Cough or your Dog?